While some countries or states finish arguing their territories by now, there is one big territorial dispute between China and India. The region is called Arunachal Pradesh, which means “land of the dawn-lit mountains” or “land of rising sun.” Arunachal Pradesh is located in the northeast corner of the India and bordered on the north by the Tibet region of China and on the east by Myanmar. After Sino-Indian War in late 1962 ended, this territorial dispute also seemed to have ended. This region acquired an independent political status in January 20th, 1972, when it was declared as Union Territory, an administrative division of India ruled directly by the national government, under the name of Arunachal Pradesh. The state of Arunachal Pradesh Bill was passed by the Parliament in 1986 and with effect from February 20th, 1987; Arunachal Pradesh became the 24th state of Indian Union. Even though Arunachal Pradesh is administrated by India as a state, China still claims most of it as a part of the Tibet Autonomous Region. International law never supports a country or a state which attempts to plunder the territory from other countries or states by threatening or warfare. Article 2 of The UN Charter clearly defines that “all Members shall refrain in their international relations from the threat or use of force against the territorial integrity or political independence of any state” (Reynolds 2004.) It is so-called a territorial dispute, which is “a disagreement over the possession or control of land between two or more countries” (“Territorial Dispute.”) What leads the territorial dispute is not only relevant to the possession or control of natural resources such as oil, coals, fertile land or rivers, but also culture and religion. In addition, it has been said that “in many cases territorial disputes result from vague and unclear language in a treaty that set up the original boundary” (“Territorial Dispute”.) Consequently, many territorial disputes possibly generate some conflicts between countries, and even worse, they can become a primary cause of wars and/or terrorism. A long time ago, before the territorial dispute between China and India emerged in Arunachal Pradesh, the first ancestors of the tribal groups migrated from Tibet during pre-historic period. Even though ancestors were there, little is known about the history of Arunachal Pradesh. Recorded history is only available in the Ahom chronicles from the sixteenth century: the British Christened, originally known as northeast Frontiers Agency (NEFA,) took administrative control of Arunachal Pradesh and it remained under this rule until 1948. Arunachal Pradesh is northeast India’s largest and remotest state, as it has railways and air services connecting only three of its town. Natives in Arunachal Pradesh used to eat “their food in uncooked condition ignorant about the discovery of fire” (WebDigitech.) They were really isolated and not aware of the development and revolution which was occurring in this globalized world. The major cause of China-India territorial dispute, which deprived peace from Arunachal Pradesh, is from immediately after Chinese Revolution in 1911. At that time, Qing Dynasty, the last Chinese Dynasty, fell and the Emperor of Qing Dynasty resigned. As a result, China, Tibet and Mongolia became equal and separate countries. In these three countries, Tibet and Mongol tried to be approved internationally as independent states, and undertook to international society. However, on the other hand, Han Chinese Republicans started small war to subjugate reins of government of Tibet and Mongol. Therefore, they could not be independent states at that time. Following this dispute, the Chinese troops crossed the McMahon Line on the August 26th, 1959 (“Arunachal Pradesh.”) They abandoned this in 1961, but in October 1962 crossed the line once again with force (“McMahon Line.”) As a result, Sino-Indian War broke out. The Chinese extended their frontier as they intruded deeper and deeper. However, this war did not go on for a long time. In 1963, the Chinese agreed to withdraw back to the McMahon Line, and also returned Indian prisoners of this war at that time. By losing Arunachal Pradesh located on the northeastern tip of India, bordering Bhutan on the west, China on the north, Myanmar on the east and the states of Assam on the south, either China or India would receive some damage in terms of economy. Both China and India are able to run good business because Arunachal Pradesh is a very good place for tourists from all over the world to visit. Evergreen forest, which covers more than 60 percent of the state area, certainly makes people feel comfortable to stay there. From this fact, Arunachal Pradesh is known for its forest resources. Forest products and industries are considered as a lifeline in Arunachal Pradesh. In fact, 75 percent of its total workforce is engaged in agriculture (mainly shifting cultivation.) Therefore, if either China or India could obtain Arunachal Pradesh, it would be able to improve its economy by taking advantage of agriculture and tourism. In addition to it, there are many fairs and festivals there such as Losar, the New Year’s Celebration of the Monpas. Another famous festival there is called Reh, which is associated with the Idu Mishmis, the six-day celebrations’ special attraction is the Priest dance. Fairs or festivals are held every month, thus tourists can visit there any time for sightseeing. 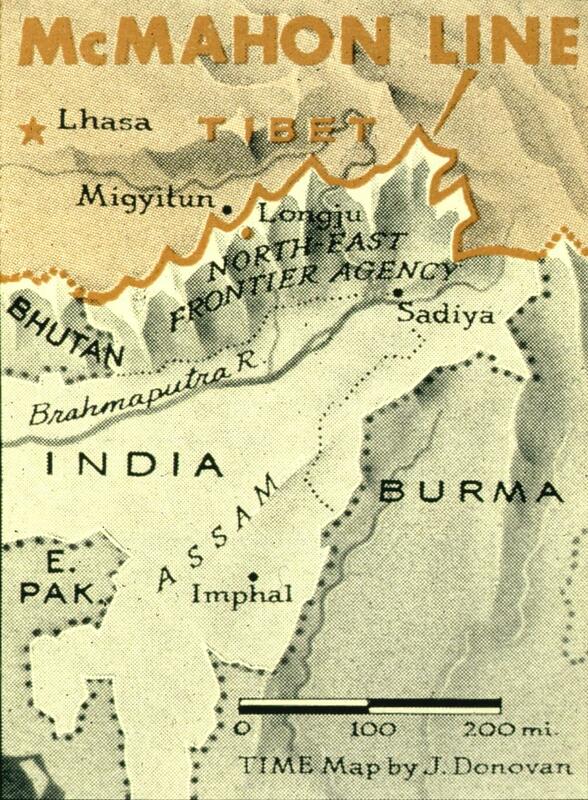 In 1962, the Chinese had a claim on what India deemed its own territory called Arunachal Pradesh. China sent many well-trained and well-armed troops to the disputed region. On the other hand, India had only ill-equipped troops there, which made them more difficult to beat Chinese troops. The Sino-Indian (Indo-China) War was started by China on October 16, 1962 on account of the territorial dispute against India. Chinese attacked India on October 20, 1962 because it was unable to reach political accommodation on disputed territory along the 3,225-kilometer-long Himalayan border. The Chinese did not invade farther, and on November 21, 1962 declared a unilateral cease-fire. They had accomplished all of their territorial objectives, and any attempt to press farther into the plains of Assam would have stretched their logistical capabilities and their lines of communication to a breaking point. Finally, the Chinese defeated India in 1962, which as a result led to the retreat of Indian Army in terms of doctrine, training, organization and equipment from the disputed area. Because Sir Henry McMahon, the British administrator, clearly established the McMahon Line as the border, which could establish buffer zones around its colony in South Asia, between British India and Tibet in 1913-14, the British have also something to do with Arunachal Pradesh dispute in terms of strategic interest. China is also relevant to the territorial dispute. On account of various disagreements with the British, China refused to accept the terms imposed by Britain. As a result, China did not recognize the validity of the McMahon Line. China probably was mostly concerned about the loss of their essential resources such as land from losing Arunachal Pradesh. Therefore, British India and China were major countries in this territorial dispute with respect to strategic interest. Arunachal Pradesh was part of the state of Assam until 1987 and was previously called NEFA. However, Arunachal Pradesh finally could gain statehood status on Feb. 20th, 1987 after making allowances for the security consideration in the east and Sino-Indian tensions (“Arunachal Pradesh.”) India was satisfied with this outcome of dispute while China still does not admit the result. Codwar: Cod Island Dispute between Iceland and the U.K.
Arunachal Tourism. “About Arunachal” <http://www.arunachaltourism.com/about.htm> Accessed on 21 Sep. 2005. Joseph, Anil. “We Don’t Recognize Arunachal Pradesh: China.” rediff.com 25 July. 2003. <http://www.rediff.com/news/2003/jul/25china3.htm> Accessed on 17 Nov. 2005. Official Web Page of Arunachal Pradesh. “Status of Agriculture in Arunachal Pradesh: Base Year 1999-2000.” <http://arunachalpradesh.nic.in/nap-status.htm> Accessed on 17 Nov. 2005. Taylor, Elizabeth. “A Review of the Social Basis for Sustainable Development in Arunachal Pradesh.”<http://www.future.org/pages/03_country_programs/2_india/013_arunachal_in_depth.ht	ml> Accessed on 24 Oct. 2005. WebDigitech “The Land of Rising Sun.” <http://www.indyahills.com/arnp/> Accessed on 25 Oct. 2005.